Curious how to hang Christmas lights? 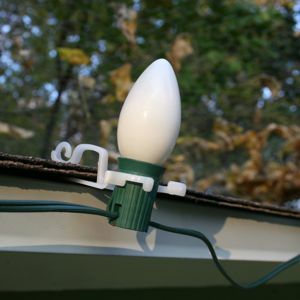 Using these types of clips gives the professional finish to any Christmas light installation. Lighter and more flexible than the All in One Clip (without the plus). This clip is designed for C7 and C9 cords. Simply clip in the socket and slide it under the shingle. Removal is just as easy. Works great on rooflines and gutters.